Former two weight world champion Carl Frampton wants a Featherweight world title fight next if he beats Filipino boxing legend Nonito Donaire on the 21st of April. The winner of Frampton-Donaire will become the WBO Interim Featherweight Champion after Oscar Valdez suffered a broken jaw a month ago. However, Frampton says that while the belt might look nice on his mantelpiece, he will not be satisfied with an interim title. In an interview with Behind the Gloves, the Northern Irishman said “Fighters in the past have called themselves a world champion after winning an interim title but I know what this is, I’m not going to call myself a world champion if I win,” he says. “I won’t feel like a world champion until I beat Oscar Valdez, Leo Santa Cruz, Lee Selby or Gary Russell jr,” Frampton says. 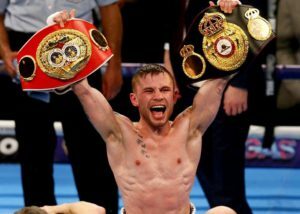 “This has just given me the option of fighting a big name and people have talked about the winner of Selby vs Warrington and obviously with me being linked to the same team, that fight can happen,” according to Frampton. There are many names on Frampton’s radar, but he says a fight with Valdez for the undisputed WBO title is a very attractive option. “If Valdez recovers from the jaw injury he got against Quigg I think that fight is probably a bit more appealing to me than the winner of the Selby-Warrington fight,” he says. “I think it just captures the boxing public much more in a worldwide sense, it’s a much bigger fight than me versus Selby or Warrington,” says Frampton. However, his first preference would be a trilogy fight with WBA Champion Leo Santa Cruz to avenge his only professional loss. “I know one fight that I definitely want and that’s Leo Santa Cruz because I think that makes sense. It’s a huge fight and it’s one each between us, it settles the score and trilogies are always a big thing in boxing,” he says. “So he’s the guy that I want more than anyone. But I think a Valdez fight is very, very appealing. After that, probably Selby,” Frampton says. The Belfast man also criticised long-time rival Scott Quigg for missing weight by a significant margin when he fought Valdez last month. “I believe he missed the weight purposely and then he didn’t do the second day weigh-in, which is just sticking the finger up to the people involved. He missed the weight by so much that he should have at least done a second day weigh-in,” Frampton says. “When you look at the tactics in the fight, he was just trying to wear Valdez down from the start. So I think that was planned. I think he missed the weight purposely and I think he didn’t do the second day weigh-in because he wanted to overwhelm Valdez and use his size and strength,” he says. “But Valdez stuck to a game plan. Quigg had good spells in parts of the fight and you have to give him credit for the injury he had himself. But I think Valdez won the fight comfortably,” according to Frampton. Clearly, there is still no love lost between them.